Water way to live through centuries at Toovey’s Mill | The Dacorum Heritage Trust Ltd.
Two mills were recorded in the Domesday Book of 1086 for Kings Langley, one for corn and the other for “fulling cloths”, worth 16 shillings at the time. Two water-driven mills were still in existence over two hundred years later. 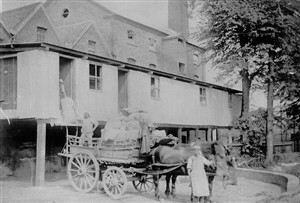 In 1587, the flour mill was leased from Queen Elizabeth I by Nicholas King and for a further two hundred years the King and the Surrey families carried out the work at the mill. A new name appeared in 1780 when Thomas Toovey, who married his first cousin Esther Surrey, moved into the Mill House and took over the milling process. Thomas died in 1830 and was succeeded by his son, also called Thomas. It was Thomas Toovey junior who, in 1846, sold the mill to the Grand Junction Canal Company for £15,000 with a 21-year lease granted back at £300 per annum. Thomas’s son, William Archibald Toovey, carried on the business, until he handed over its operation to his son, Thomas William Toovey, who began the necessary modernisation with the installation of a steam engine and steel roller. Steam lorries were bought to replace the wagons and horses formerly used to help make deliveries. The flour was delivered to destinations within a 25- mile radius, including London. Customers were Price Ltd. and McVitie’s, amongst others. By 1915, T.W. Toovey Ltd had been formed. Thomas’s nephew, Lewis Dean, became the owner and manager in 1927 and remained managing director until his retirement in 1971. Thomas William Toovey died in April 1933. The well-known company Fellows, Morton & Clayton Ltd., was also used as a convenient canal carrier. When these wide-boats were requisitioned during World War 1, Toovey’s bought its own boats to carry the wheat from Brentford to Kings Langley. 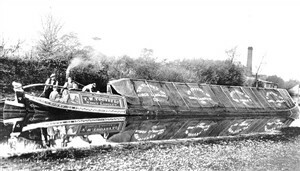 The boats named ‘Langley’ (1916) and ‘Golden Spray’ (1922) were both built by Bushell Bros. of Tring, but were sold in 1930. 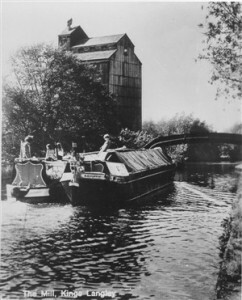 Milling ceased in 1939 and the company’s name changed to Kings Langley Mills Ltd. It was sold to Spiller’s, who continued to make flour under the Toovey trade name ‘Golden Spray’ until 1950. Lewis’s son, Richard Dean, became joint managing director in 1963 and took full charge on his father’s retirement. The manufacture of animal foodstuffs was the only product by then. In 1978, the company went into voluntary liquidation and in 1980 all the buildings were demolished, with the exception of the Mill House. The mill-race survives within Toovey’s Mill Close housing estate.